*****DISCONTINUED***** Subtle + Sophisticated Wedding Invitation for a Formal Wedding. The embossed pattern is in SILVER, not gold, as shown. Tall + Sophisticated Gatefold Invitation made from lustrous silk-mesh paper with SILVER embossed pattern. 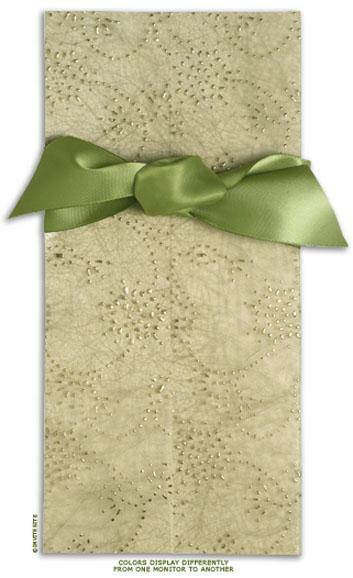 Handmade paper wrapper and champagne pearlescent invitation card, rsvp card, and envelopes. Closes with sage green double-faced satin ribbon. Translucent Spun mesh paper with raised SILVER dot pattern wrapper. Wrapper is scored for easy folding, with die-cut slits at the sides, Ribbon threads through the wrapper. Invitation card is printed on Italian pearlescent cardstock. Wrapper:Spun mesh paper with gold dots in a relief pattern. Scored and die-cut.